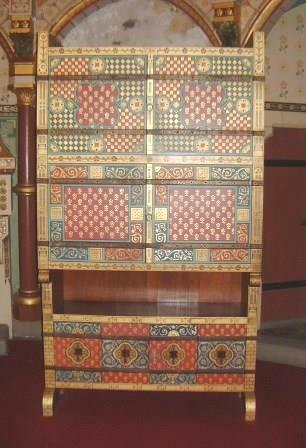 This is another cabinet from Lady Bute's bedroom at Castell Coch, which is a tour de force of new Gothic forms & decoration, in a recreated C13th French style castle. This cabinet was produced after Burges's untimely death, but is actually very close to a Design he did for an escritoire. The only real difference is in the lozenge panels, with Burges they would have had painted scenes or figures, here they just use stencilled diaper patterns. It is quite an imposing piece, although dwarfed by the bedroom. Like Burges's best work, this has a great shape, but is composed of mainly flat surfaces, relying on the decoration to give it visual life. A door panel is shown above, showing the detailed painting that could go into Burges style work. 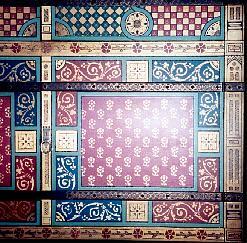 The patterns & colours are all typical of Burges. This piece could be used as a bookcase, a PC/Office cabinet, home cinema cabinet, drinks cabinet, whatever you want. We have the measurements for this piece & could reproduce it exactly or adapt it anyway you like. Made to order. This piece could also be adapted to make a bedroom wardrobe, with full length doors.